Beta tutorial Please report any issues in the comments section. PathSeq is a GATK pipeline for detecting microbial organisms in short-read deep sequencing samples taken from a host organism (e.g. human). The diagram below summarizes how it works. In brief, the pipeline performs read quality filtering, subtracts reads derived from the host, aligns the remaining (non-host) reads to a reference of microbe genomes, and generates a table of detected microbial organisms. The results can be used to determine the presence and abundance microbial organisms as well as to discover novel microbial sequences. PathSeq pipeline diagram Boxes outlined with dashed lines represent files. 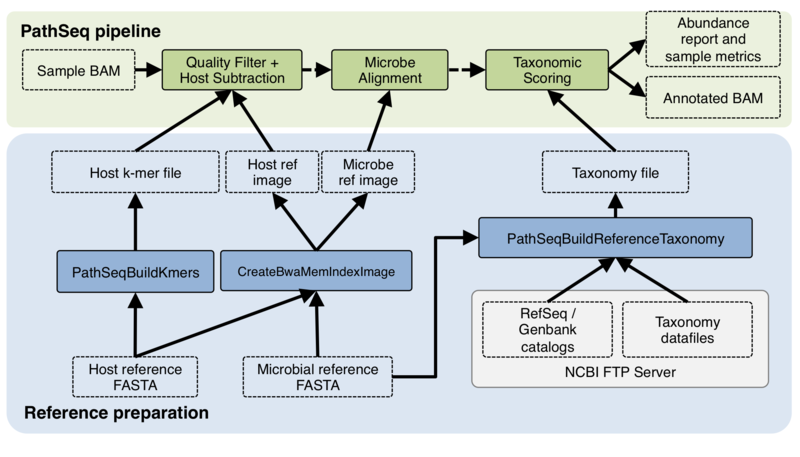 The green boxes at the top depict the three phases of the pipeline: read quality filtering / host subtraction, microbe alignment, and taxonomic abundance scoring. The blue boxes show tools used for pre-processing the host and microbe references for use with PathSeq. A more detailed introduction of the pipeline can be found in the PathSeqPipelineSpark tool documentation. For more information about the other tools, see the Metagenomics section of the GATK documentation. Host and microbe references must be prepared for PathSeq as described in this tutorial. The tutorial files provided below contain references that are designed specifically for this tutorial and should not be used in practice. Users can download recommended pre-built reference files for use with PathSeq from the GATK Resource Bundle FTP server in /bundle/pathseq/ (see readme file). This tutorial also covers how to build custom host and microbe references. The PathSeq tools are bundled with the GATK 4 release. 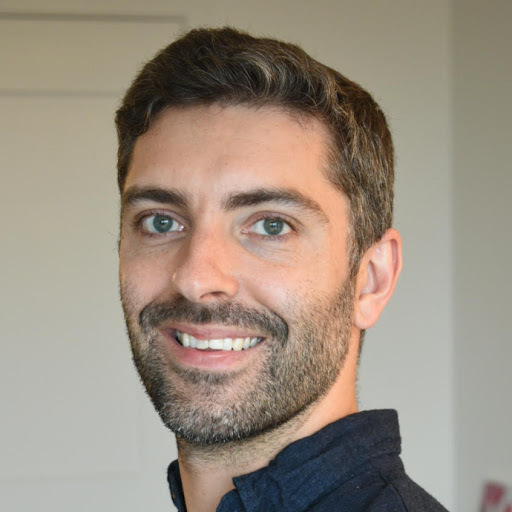 For the most up-to-date GATK installation instructions, please see https://github.com/broadinstitute/gatk. This tutorial assumes you are using a POSIX (e.g. Linux or MacOS) operating system with at least 2Gb of memory. This ran in 2 minutes on a Macbook Pro with a 2.8GHz Quad-core CPU and 16 GB of RAM. If running on a local workstation, users can monitor the progress of the pipeline through a web browser at http://localhost:4040.
output.pathseq.bam : contains all high-quality non-host reads aligned to the microbe reference. The YP read tag lists the NCBI taxonomy IDs of any aligned species meeting the alignment identity criteria (see the --min-score-identity and --identity-margin parameters). This tag is omitted if the read was not successfully mapped, which may indicate the presence of organisms not represented in the microbe database. score : indicates the amount of evidence that this taxon is present, based on the number of reads that aligned to references in this taxon. This takes into account uncertainty due to ambiguously mapped reads by dividing their weight across each possible hit. It it also normalized by genome length. score_normalized : the same as score, but normalized to sum to 100 within each kingdom. reference_length : reference length (in bases) if there is a reference assigned to this taxon. Unlike scores, this number is not propagated up the tree, i.e. it is 0 if there is no reference corresponding directly to the taxon. In the above example, the MG1655 strain reference length is only shown in the strain row (4,641,652 bases). In this example, one can see that PathSeq detected 189,580 reads reads that mapped to the strain reference for E. coli K-12 MG1655. This read count is propogated up the tree (species, genus, family, etc.) to the root node. If other species were present, their read counts would be listed and added to their corresponding ancestral taxonomic classes. Since the reported number of E. coli reads is the same number of reads in the output BAM, there are 0 reads of unknown origin in this sample. This should generally be set to a value greater than the sum of all reference files. The input reads must pass an initial validity filter, WellFormedReadFilter. A common cause of empty output is that the input reads do not pass this filter, often because none of the reads have been assigned to a read group (with an RG tag). For instructions on adding read groups, see this article, but note that PathSeqPipelineSpark and PathSeqFilterSpark do not require the input BAM to be sorted or indexed. 18/08/10 22:41:47 INFO ADAMKryoRegistrator: Did not find Spark internal class. This is expected for Spark 1.
java: bwa.c:329: bwa_mem2idx: Assertion `k == l_mem' failed. One thing I notice is that you have set the Java heap size to 180gb but only requested 128gb of memory. I would try again requesting 200gb if possible. Another possibility that other users have reported is your reference files may have truncated during transfer. Hello, can you please provide suggested instructions on how to subset the output .bam file to get the mapped reads for a microbe that is reported in the output .txt file. It would seem I could use bamtools split command or samtools view command to susbet from .bam file mapped reads of interest, but the output .txt file uses taxonomy ID in describing microbes and the tag in the .bam file lists accession numbers, cannot directly use the output .txt file with the output .bam file from what I can tell. In addition, if I want to visualize these mappings in a viewer, could you please provide command for which I can use to subset from the pathogen reference.fa file the corresponding reference sequence. Basically need tutorial workflow commands please that demonstrate how to take a result of interest reported in the text file and subset/visualize the corresponding reads mapped to the corresponding reference in a viewer of choice. Thank you in advance. Just to follow-up on my previous post, I took the output.bam, sorted and indexed using bamtools, then generated a header using bamtools. I then used VI to locate the reference length reported in the output.txt file for a microbe of interest in the header file to find the corresponding SN:accession. I then used samtools view -b to subset the sorted bam file to generate a new bam file that only includes those reads mapping to the SN:accession. I then sorted and indexed this new bam file. After, I searched NCBI for the reference accession and downloaded the sequence and import it and the subset sorted indexed bam files into IGV. In IGV, I viewed the mapping and exported the consensus sequence and performed blastn search restricting the database to the kingdom for which the microbe of interest falls to identify how the consensus sequence compares to those that are known. What would be very helpful is to include a column in the output.txt file that lists the corresponding SN:accession in the output.bam file. Would also be helpful if there could be a parameter pass that allows you to also generate a reference.fa file that is indexed for the microbes represented in the output.txt file. In that way, easy loading into IGV or other viewer can be performed instead of trying to load the reference.fa file for all microbes (huge). Looking forward to a next action tutorial that works with the output .txt and .bam files if you could muster and post please, would be very helpful. Would be helpful also if the tutorial not only demonstrated investigation of mapped reads as above but also how you can take unmapped reads, perform de novo assembly, and obtain consensus sequence for blast characterization. Thanks in advance again. I asked the developer for help. He should get back to you soon, but he is on vacation for the rest of the week. There is an easy way to retrieve reads mapped to a specific organism. PathSeq adds a YP tag to the end of each SAM record that lists the taxonomy IDs of microbes to which the read mapped (if the YP tag is absent, then the read is unmapped). This should make your task substantially easier. Thank you for your suggestion to optionally emit the reference sequences of mapped organisms, which would indeed be very useful in a lot of use cases. I think your approach of downloading the references manually, though burdensome, is the best solution for now. Also thank you for your suggestion for a more in-depth tutorial. Analyzing the mapped reads should be done with care, as ambiguous alignments can present challenges for interpretation. PathSeq is designed primarily for the purpose of pathogen detection, i.e. to determine the presence (as opposed to abundance) of micro-organisms, although abundance estimates are provided. It is much easier to interpret the unambiguous alignments, which can be used as direct evidence for detection. However, depending on the assembler, sample, and sequencing mode (ie DNA or RNA), you may obtain many thousands of novel contigs that need to be filtered (e.g. by read support) to exclude false positives. [September 19, 2018 2:26:20 PM GST] org.broadinstitute.hellbender.tools.spark.pathseq.PathSeqPipelineSpark done. Elapsed time: 36. Hi. I have been playing with PathSeq and it seems to be working great in the case where I have a reference of a single microbe I am assessing against. However, when I scale that up to 100 microbes in my fasta and I have multiple read alignments occurring for each read then I see things kind of fall apart where most reads are not added to score. I have tried a few options around identity (score threshold and margin) with no real change. Just throwing something out there -- when you have multiple alignments with different order of primary and secondary alignment -- does PathSeq view reads aligning to different fasta entries as improper alignments ? Is there an option you would recommend to mitigate that? Can the Path-Seq tool accept uBAM from DNA-Seq without issue? Or, only RNA-Seq? How might I be able to retrofit the tool for use with a uBAM from DNA-Seq if cannot readily accept?